Projects time onto wall or ceiling for easy viewing. Reads Indoor temperature Celsius and Fahrenheit. Requires 2 'AAA' batteries (not included). 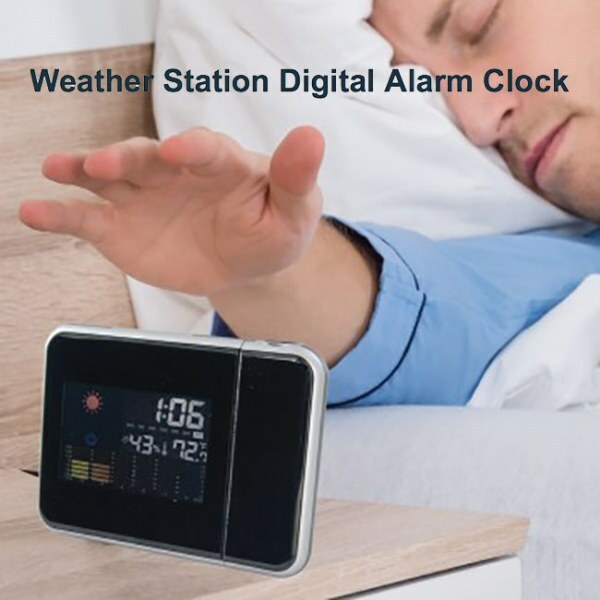 Get all your information about the day with this Weather Station Digital Alarm Clock featuring a compact design with an LCD display with a backlight, snooze button, multiple features and a projector that shows the time on the wall or ceiling for easy viewing. Extra features include humidity, indoor temperature, calendar and days of the week. Measures approximately 6" x 2.25" x 4.375". Requires 2 &apos;AAA&apos; batteries (not included). Clock can also be powered with a DC 4.5V plug (not included). Instructions included. It seemed OK at first - until I discovered that it does not have a light on all the time It is very hard to see the time at night when ther is no light!! !